These jerseys are made with the highest of quality and attention to detail. 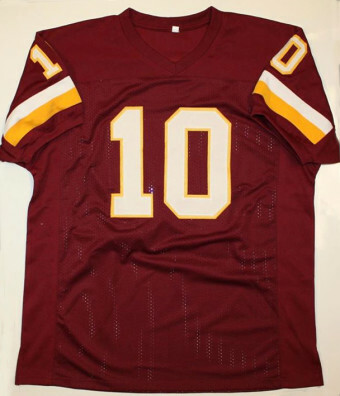 They are comparable to that of authentic jerseys worn in the professional leagues. The cloth is heavy and the numbers are stitched on (NO PRINT-ON NUMBERS HERE). The only difference between the authentics and these jerseys are that the infringing logos aren’t on these jerseys and they’re over $200 cheaper. The initial purpose of these jerseys were to have a cheaper alternative for athletes to sign before we framed the jersey, but the demand was too high and we had to begin selling them for people to wear. The possibilities are endless! They can be customized to match professional teams, college teams, and even High School teams. They can be made for football, baseball, basketball, and even hockey. Customize the name and the number and make it completely yours! All you need to do is pick your jersey in the options below. We will take care of the rest. We are placing orders regularly and we try to batch all of our orders together. Typically our orders are delivered between 2-4 business weeks, with the occasional delivery that is sooner than that. If there are any issues, one of our customer services representatives will contact you to discuss with you.